The Saturday Sessions in Bear Plaza are rotating music and art weekends located in the heart of downtown New Bern, North Carolina. Saturday Sessions run from 1pm-5pm and begin Saturday April 6, 2019 and will run every Saturday until Mumfest weekend in October. Special Saturday Sessions children’s programming is available. 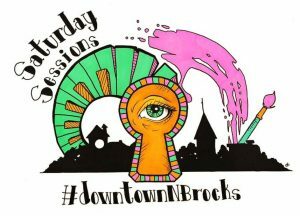 Between 1pm-5pm the second and fourth Saturdays indoors at the The Next Chapter Books and Art and the first and third Saturdays outside of The Craven Arts Council/Bank of the Arts, children of all ages are encouraged to paint #downtownNBrocks and hide them around town. The Craven Arts Council/Bank of the Arts will also be the host location of Saturday Session Storytimes held the second and fourth Saturdays at 1pm and 3pm. Please join us as books about community, nature, and neighborhood are shared alongside beautiful local works of art on display. Saturday Session April 27 from 1pm-5pm will be another fun-filled Art weekend in Bear Plaza featuring various artists demonstrating their disciplines. Please join us in this immersive cultural community experience. All are welcome. Please keep in mind there is always something for the kids to do, rain or shine, in participating downtown venues.